The Shinbashi Enbujo Theater has a rich history dating back to 1925, when it opened with an Azuma Odori dance revue by Shinbashi geishas—an ideal launch event for a venue created with the laudable goal of presenting and promoting the geisha’s traditional performing arts to a wider audience. The building was reconstructed in 1948 after it was partly destroyed during World War II, and in 1982 the theatre’s interior and audio-visual tech underwent major renovations. 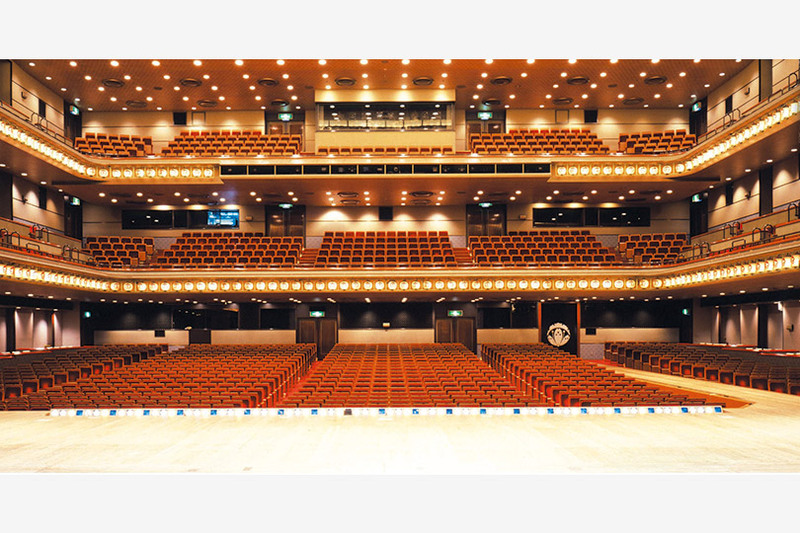 Its stage was built according to kabuki traditions, with a hanamichi, a raised passageway running straight through the three-tiered auditorium, which has 1,424 seats. Hanging paper lanterns carry the theater’s distinctive logo, known as setsugekka (雪月花), which features snow, the moon, and flowers. Although the theater was built to promote the traditional performing arts of the geishas, it soon added other genres of performing arts to its repertoire: kabuki, Shakespeare plays, musicals, and in more recent years, super-kabuki, an experimental form of traditional kabuki that takes inspiration from manga and anime. The special effects–laden super-kabuki II project One Piece was performed for the first time at this theater, and its success spurred the development of a new kabuki, Naruto. Yet while remaining a proud innovator, the Shinbashi Enbujo Theater has not forgotten its roots. The Azuma Odori, the spectacle that graced its stage back in 1925, is still held once a year and ticket-holders can mingle, chat, and snap selfies with the geisha during the intermission. Innovative production techniques and seating that is unusually close to the stage makes this a particularly intimate theater-going experience, and a truly memorable night out for international visitors to Japan. While there is no shortage of great eating options in Ginza, you don’t need to leave the theater if you feel hungry, as the theater restaurant offers food created by local fine-dining restaurants. The Shinbashi Enbujo is located less than ten minutes’ walk away from Kabuki-za Theater.